Credit union loan balances are growing, and so are the number of credit union members in the U.S. That's according our Credit Union Trends Report for June 2016 (based on April 2016 data). During April, credit unions picked-up 353,000 in new memberships, loan and savings balances grew at an 11.9 percent and 7.5 percent seasonally-adjusted annualized pace, respectively. Firms hired 123,000 workers, nominal consumer spending increased 1.0 percent, and long-term interest rates decreased 8 basis points. Real GDP is expected to grow 2 percent over the next two years supporting credit union lending and membership growth. At the end of April, CUNA’s monthly estimates reported 6,128 credit unions in operation, 35 fewer than one month earlier. Year-over-year, the number of credit unions declined by 304, more than the 267 lost in the 12 months ending in April 2015. Total credit union assets rose 1.0 percent in April, faster than the 0.2 percent gain reported in April of 2015. Assets rose 8.4 percent during the past year due to a 7.8 percent increase in deposits, a 25 percent increase in borrowings, and a 6.5 percent increase in capital. The nation’s credit unions increased their loan portfolios by 0.5 percent in April, less than the 1.0 percent pace reported in April 2015. Loan balances are up 10.7 percent during the last 12 months. With loan balances growing faster than savings, credit union liquidity is tightening up as the credit union average loan-to-savings ratio reached 76.4 percent, up from 74.4 percent in April 2015.
Credit union memberships rose 0.33 percent in April, down from the 0.38 percent gain reported in April 2015. 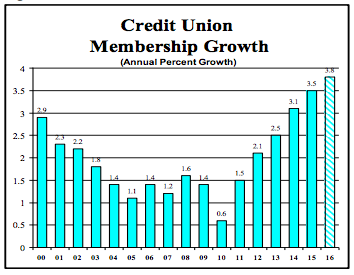 Memberships are up 4.2 percent during the past year due to robust demand for credit, solid job growth and credit unions having comparatively lower fees and loan interest rates. Credit union loan delinquency came in at 0.73 percent in April, similar to April 2015. However, credit union loan charge-offs rose to 0.52 percent in the first quarter, from the 0.47 percent reported in the first quarter of 2015, as loans originated over the last couple of years are now seasoning.